Everyone wants their child to be successful. You know that your kid has endless potential, and it may be frustrating when you feel they aren’t reaching it. However, these days, the pressure to perform well, academically, athletically, and socially, has many parents pushing their children to achieve, even before elementary school starts. While you have the best intentions for your child (you only want them to be happy, after all), if your love hinges on how well your child performs, you may be doing more harm than good. Putting too much focus on success and making your approval dependent on how much your child achieves weakens your bond and hurts their development across the board. 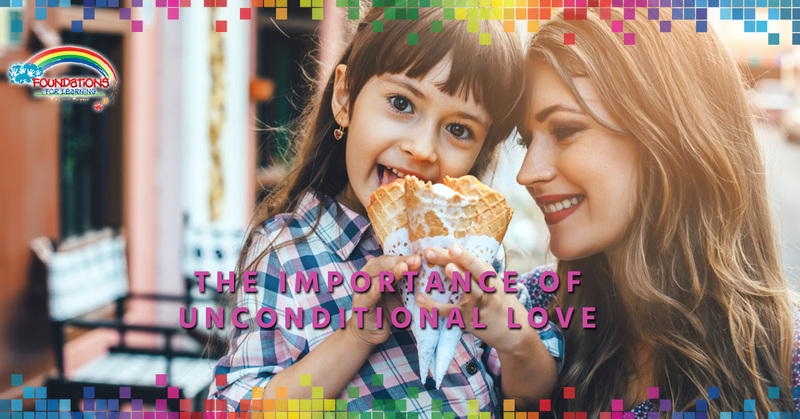 The love you show to your child should be constant and unchanging, regardless of what they do, for several reasons. Children thrive when they are given affection unconditionally, and this isn’t just our opinion; research has demonstrated this fact. In one study from UCLA, children whose parents’ love was conditional on their success experienced more stress. Stress is detrimental to everyone’s health, but it is particularly devastating to children. Those who experience high levels of stress in childhood are at much higher risk for a variety of health concerns, including depression, anxiety, high blood pressure, cardiovascular problems, and high cholesterol levels. Children who experience unconditional love from their caregivers, on the other hand, are more resistant to these health risks. When a child is raised in a loving and nurturing environment, they are able to thrive mentally and emotionally. When parents are unconditionally loving, children are physically healthier as well. One study that came out of McGill University focused on the health effects of authoritarian parents when compared to authoritative parents. Authoritarian parenting is characterized by placing focus on children’s achievement with very little affection. In contrast, authoritative parents discipline their children but also are affectionate unconditionally. Children with authoritarian parents were more than 30 percent more likely to be obese than children with authoritative parents. The theory is that authoritarian parents may tell their children that they are eating “bad” foods, but will not explain why. Authoritative parents, in contrast, explain to their children nutrition and which foods are “good” and “bad” for them. The authoritative message stays with children, while the authoritarian approach may make certain foods forbidden, and therefore, more appealing. Love and affection don’t just help children with their physical and mental health; it also impacts their brain development. One research study from Washington University in St. Louis found that child with mothers who were affectionate unconditionally had larger hippocampi. The hippocampus is the part of the brain that is connected to memory, learning, and stress. For the study, participating parents completed a task while their child waited to open a gift. Parents needed to prevent their child from opening the gift until their task was complete. The idea was to simulate a typical day of parenting. After this, researchers took scans of the child’s brains. The ones who were nurtured by their parents had significantly larger hippocampi. This study indicates that nurturing parenting allows children to grow into adaptable human beings. This may not come as a surprise to you, but children feel a stronger bond with affectionate parents than parents who only offer conditional support. One study from the University of Missouri-Columbia demonstrated this in 2013. Participants in the study played with their children as researchers watched and tracked how often mothers intervened with their children’s toys, instructing them how to use them. When parents spent more time taking control over play, children demonstrated more negative feelings towards their mothers. On the other hand, children whose mothers were more hands-off and affectionate displayed more positive feelings towards their parents. When parents show unconditional love, children take their direction more seriously because they know their parents are instructing them because they care. When parents are very directive without warmth behind it, children interpret it as controlling and feel less close to their parents. Love makes children feel safe. They know they will be fine because they have the safety net of their parents’ unwavering love and support. In contrast, children whose parents’ love is dependent on merit suffer from a much worse feeling of failure, making them feel unsafe. When children fear failure, they are less interested in their education. They focus more things they already know they are good at and don’t concern themselves with learning new skills because they don’t want to fail. A study by The British Psychological Society found that children with parents that criticized them often and held them to high standards were more fearful of failure. This prevented children from learning new skills, impeding their development. At Foundations for Learning, we pride ourselves on offering child care based on unconditional love to help your child thrive and grow. Contact us today to schedule a tour of our child care facility in South Windsor!